I was going through my purse yesterday exploring, hoping I might find a reminder that could shed light on the purse’s past usage. I was vaguely hoping that I might find a peppermint or a butterscotch candy (Hey, don’t judge me). This was a purse that I had not used in a while, but was ready to put back into rotation. I don’t know if you do this but whenever I change purses there is always some leftover artifact, gum, candy, or receipt that got left in the purse from the last time I used it. I enjoy finding these reminders of past trips or visits to other cities. I really enjoy trying to figure out the events surrounding these carry over items. This specific purse is a corduroy bag that is carried like a back pack. It comes in handy if I need to carry knitting or books. Smaller that a regular back pack but not quite as small or old fashioned as a fanny pack. I like the idea of fanny packs but not the look. Nothing says tourist, quite like a fanny pack. Anyway I digress. I’m digging in this purse and I pull out a computer typed document that looks like a submission form. In fact at the very top it says “Thank you for submitting the following information” I don’t remember the events that led up to me submitting the information. I do remember seeing this form before. There is a vague recollection of me sitting at my computer and seeing this document but I can’t quite put my finger on that button in my mind that would release the full memory. Reading this document makes me feel at peace and, yes I agree with everything that it says. For two days I keep pulling this document out of my purse, re-reading it and feeling good about what it says. Now I want to know what was going on in my life that I needed this reassurance. There is not a date or web address on the document. I went through the confirmation again. 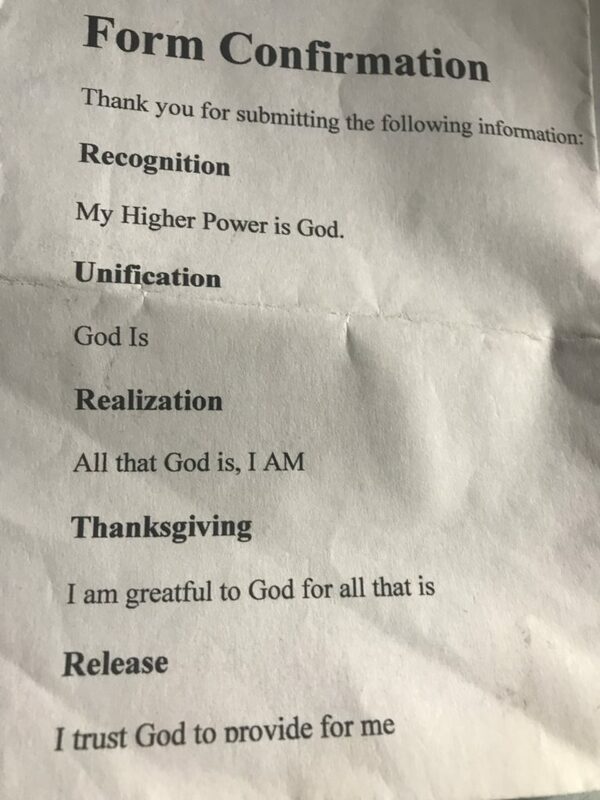 This is powerful and so I google the words, “Recognition, Unification, Realization, Thanksgiving, and Release.” Google says that this is a spiritual mind treatment that Dr. Earnest Holmes developed to help release you from problems. I don’t go too much deeper into the Google information, but there are books you can buy and other information available. I don’t think I knew this when I submitted my beliefs. What I do know is this. At some point in my life, I needed to find a way to stop thinking about or trying to solve a problem, I needed to be released from it. How I came upon this I don’t know. What’s more important is where I am now at this point in my life. To re-discover this document at a time when I do not have any issues, or problems to resolve. That’s Good News to all of those men and women who have had to listen to me lament about one issue or another over the years. I remember years ago what a woman advisor told me. I was going on and on about my problems. She said, “One day you will look back and you won’t even remember this problem” I could not see that happening. The issue was so big that I thought it would never be resolved. She advised me to turn it over to my Higher Power, and I did. I don’t remember what those problems were. My mantra stays true: God has (always) given me what I needed for each new day. Sometimes the battle is not mine to fight. The artifact in my purse was my reminder that problems don’t last long. They do get resolved. In fact, I got confirmation.